If there was ever any doubt about the bright future of OLED television sets, that can be all but dispelled by the news today that Panasonic is planning to market a 40-inch model within three years. The unofficial word is that the Japanese company will convert its Kyoto semiconductor R&D lab into a full-scale OLED TV factory at a cost of "several dozen billion yen" (£165 million and upwards). The Nikkei newspaper is reporting that the large organic electroluminescent TVs will be preceded by 20-inch prototypes made next spring in Kyoto. After that, it will add an OLED production line to another facility in nearby Himeji and will shift around 200 of its most experienced staff onto the project. We asked for confirmation from Panasonic in Tokyo, only to be told: "Panasonic is continuing R&D on OLED panels with an eye toward the future development of the Himeji… plant." However, the official line is still guarded: "At this time, there is nothing decided about how this R&D will develop into a specific business operation." The likely move comes less than a year after Sony introduced the 11-inch XEL-1, which was the world's first OLED television set. 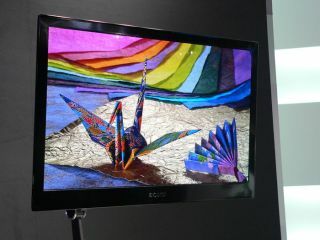 Sony has also shown a 27-inch prototype, while Samsung has a 31-inch pre-production model of its own.